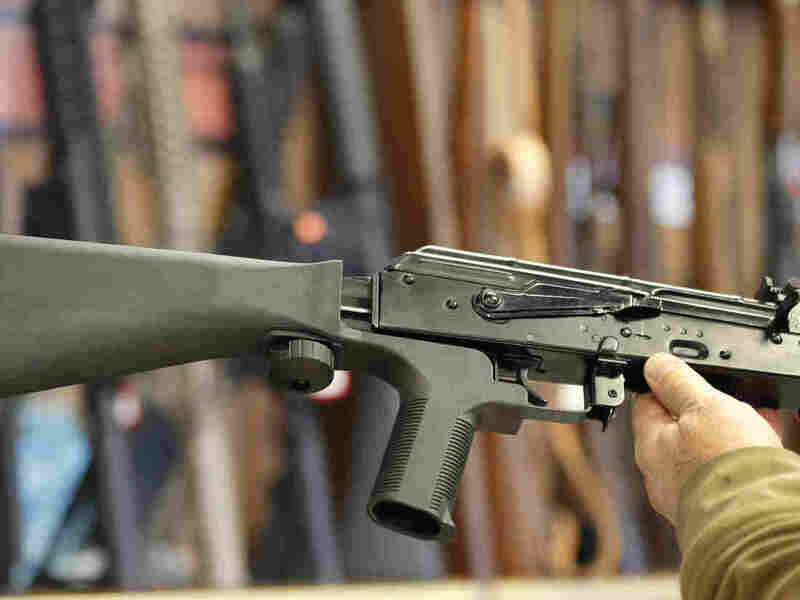 Massachusetts Becomes 1st State To Ban Bump Stocks After Las Vegas Massacre : The Two-Way The restriction was added to a budget bill Thursday and was signed into law with minimal dissent on Friday. A bump stock device (left) can be fitted to a semi-automatic rifle to increase firing speed. Authorities say the gunman responsible for the massacre, which left 58 people dead and hundreds wounded, used bump stocks to allow his semi-automatic weapons to rain down considerably more bullets on the unsuspecting crowd during the attack. Bump stocks attach to semi-automatic weapons and enable sustained firing by using the force of the weapon's kickback to bounce the firearm against the shooter's trigger finger over and over. The newly approved ban provides a 90-day grace period for bump stock owners to discard their devices. The ban was approved with relative ease and little fanfare Friday, when Polito, acting in place of Gov. Charlie Baker who was away on vacation, signed an appropriations bill to which the bump stock ban had been added. The state legislature had passed the amended spending measure on Thursday. In the days after the Las Vegas shooting, Baker, who is a Republican, had made clear he would support outlawing bump stocks, saying, "If that were to pass tomorrow, we would sign it." The Gun Owners' Action League of Massachusetts, which is affiliated with the National Rifle Association and appeared to be the most vocal opponent of the new ban, spent Friday beseeching its members to call the governor's office in an ultimately unsuccessful attempt to have the bump stock provision vetoed. The Giffords Law Center To Prevent Gun Violence — founded by former U.S. Rep. Gabrielle Giffords, who was shot and wounded at a public event in Arizona in 2011 — celebrated the ban's approval on Friday, saying in a statement it hoped other states would "follow Massachusetts' lead." Massachusetts is, however, not the first state with a bump stock ban on the books. Long-standing gun regulations in California include punishments aimed at any device that "allows the firearm to discharge two or more shots in a burst by activating the device." After the tragedy in Las Vegas, in what appeared to be an unusual display of bipartisanship, Democrats, Republicans and even the NRA expressed support for some kind of regulation for bump stocks. "The NRA is calling for a regulatory fix for bump stocks rather than legislation. And House Speaker Paul Ryan, who first signaled an openness to considering congressional action, is now siding with the NRA. Ryan and the NRA say the best approach is for the Bureau of Alcohol, Tobacco, Firearms and Explosives, or the ATF, to regulate the devices." But — complicating matters further — regulating bump stocks is something many view as outside of the purview of the ATF. As NPR's Ryan Lucas explained, U.S. law gives the ATF authority to regulate machine guns, which are defined as any weapon that can shoot more than one bullet "by single function of the trigger." "It is that last phrase — 'by a single function of the trigger' — that is key to understanding ATF decisions, said Rick Vasquez, a firearm consultant and former acting chief of the ATF's firearms technology branch, which conducts classification reviews. "If a gun fires more than one bullet with a single pull of the trigger, then by law it is considered a machine gun. If, however, a gun fires only one bullet for each pull of the trigger, it is not. "Bump stocks, Vasquez said, enable an accelerated shooting rate, but the way they are designed ensures that each pull of the trigger only unleashes one bullet. That means, he said, that they don't qualify as machine guns under current law." A recent poll conducted by NPR showed "88 percent of Democrats, 77 percent of Republicans, and 82 percent of independents favor banning bump stocks. But while three-quarters of Democrats 'strongly favor' this kind of ban, only around half of Republicans and independents do."